The Fate of this Aircraft – Lost without a trace over the English Channel – On Friday, 25 August 1944, (a part of) the Aircraft of 7 Squadron (RAAF), took off for a Mission to Brest in France from a Station (airfield) in or near Oakington. One of the crew members was Flight Sergeant H Stenhouse RAAF. He departed for his mission at 22:24. He flew with an Avro Lancaster (type III, with serial NE123 & code MG-J). His mission and of the other Crew members was planned for Saturday, 26 August 1944. The Weather, as usual during that lachrymose summer, caused difficulty. On 1st August for example, out of 719 Aircraft of Bomber Command sent to Bomb 6 sites and a Depot in the Forest of Nieppe, only 74 reached their Targets, and the United States 8th Air Force was almost equally unlucky. From the 3rd to the 6th the weather improved & 12 Attacks were made by Bomber Command on various places reported to be Storage Depots; 2,650 tonnes fell on the Forest of Nieppe, 3,400 on the Bois de Cassan, 3,100 on Troissy St. Maximin & 2,300 on St. Leu d’Esserent. All told, in one week, nearly 15,000 tonnes of Bombs were cast down upon Depots or V1 Launching Sites. In the 2nd half of the month Bomber Command persisted in its Attacks, a notable Assault being that of 18th August, against a Storage Depot at Forêt de l’Isle Adam, in the Oise Valley North-West of Paris, when over 700 tonnes of Bombs were dropped, whilst on the Night of the 25th/26th the Opel Works at Rüsselsheim were attacked by 410 Aircraft & received over 1,500 tonnes. To end the month, on 31st August, Storage Depots in the Pas de Calais received 2,400 tonnes to which was added a further 500 tonnes on 1st September, this Attack being the last made by Bomber Command against Flying Bomb Sites, the Allied Armies having by then cut Communications with Germany. The Americans were also active, Peenemünde, and a Factory close to the notorious Concentration Camp in Buchenwald, near Weimar, being Attacked. 1,114 Aircraft – 601 Lancasters, 492 Halifax’s, 21 Mosquitos – carried out major Raids on the Bois de Cassan, Forêt de Nieppe & Trossy St Maximin V1 Flying-Bomb Stores. The weather was clear and all Raids were successful. 6 Lancasters lost, 5 from the Trossy St Maximin Raid & 1 from the Bois de Cassan raid. 1 Lightning & 1 Radar Counter Measures Aircraft accompanied the Raids. The Unit’s role was Radar Countermeasures (RCM) and this entailed the identification of Enemy Radar patterns & wavelengths. Once ashore at Normandy, the Allies experienced a serious Setback from the Terrain. Farmers’ fields were bordered by thick Hedgerows, bocage that proved a natural boon to German Defenders, affording them Cover while forcing the Allies to follow predictable Paths of advance around it. One of the most difficult problems of Hedgerow Fighting was preventing Tanks from riding up over the Hedge and exposing their vulnerable undersides to Anti-Tank Fire. The solution was disarmingly simple. An inventive Sergeant fitted “Tusks” to the prow of a Tank, which pinned the Tank to the Hedge and held it in place as the Engine punched it through in a shower of soil. This “absurdly simple” device (in Bradley’s words) freed the Army’s Armoured Forces for a fast-moving mobile Breakout across France. Any Breakout from the Lodgement area would require the insightful & creative use of Air Power, including Bomber Aircraft such as the Halifax & Lancaster and USAAF B-17 & B-24 Operating in a Troop-Support Role. Altogether there were 6 Major Raids by Heavy Bombers in support of Breakout Operations in Normandy. The 1st of these involved 457 Halifax & Lancaster Bombers from RAF Bomber Command on 7th July, in support of Montgomery’s assault on Caen. The 2nd was an even larger Raid by 1,676 Heavy Bombers and 343 Light & Medium Bombers on 18th July. On the 25th, American Bombers of the 8th & 9th Air Forces struck at Saint-Lô, preparatory to the 1st Army’s Breakout. A 4th Attack on the 30th July supported the 2nd British Army South of Caumont. Then an Anglo-American Raid on August 7-8 supported the Attack of the 1st Canadian Army toward Falaise from Caen, and the 6th Raid, again supporting the Attack on Falaise, followed on 14th August. Overall, the Allied High Command considered these Raids successful, and German Soldiers caught in them testified to their devastating (if short-lived) impact upon morale. Field Marshal Hans von Kluge, Rommel‘s successor, complained that Bomb-Carpets buried Equipment, bogged down Armoured Units, and shattered the Morale of Troops. Unfortunately, the Terrain disruption worked both ways: it Hindered the Attacker as much as the Defender, and, in fact, bought the Germans time to regain some composure and Dig in for the follow-on Attack. If such Air Attacks were to be useful, they had to be followed immediately by a follow-on Ground Assault. When this occurred, Allied Ground Troops found German Defenders dazed & prone to Surrender. 288 Lancasters of Nos 1, 3 & 8 Groups Attacked Bec-d’Ambes & Pauillac Oil Stores in clear conditions & without loss. 27 Serrate Radar Equipped Mosquito’s were used as Escorts to the Bombers Attacking these 2 Targets; this was the 1st use of No 100 Group Mosquito Fighters in this way. They did not encounter any German Fighters. 30 Jun 1943 – First use of Serrate Radar Homing Equipment fitted in RAF Night-fighting Aircraft. The receivers allowed Beaufighters & Mosquito’s to home in on German Night-Fighter Interception Radars. 7 Mosquitos to Cologne and 4 to the Forêt de Nieppe, 14 Radio Counter Measure Sorties, 10 Lancasters of No.8 Group on a special Operation in Support of Ground Troops, described as ‘a Recce of Target marking by Ground Forces in the Battle Area‘, 10 Mosquito Patrols, 12 Stirlings Minelaying off Brest, 22 Aircraft on Resistance Operations. 1 Stirling Minelayer lost. 1,019 Aircraft – 614 Lancasters, 392 Halifax’s, 13 Mosquitoes – attacked 5 Aiming Points in Front of Allied Ground Troops in Normandy. The Attacks were carefully controlled – only 660 Aircraft Bombed German Strong Points and the Roads around them were well Cratered. 10 Aircraft – all Lancasters – were lost, 7 to German Fighters, 2 to Flak & 1 to an unknown cause. Unfortunately, Heavy Bomber Missions could cause serious problems. The 1st 2 Strikes on Caen resulted in numerous “collateral” casualties to French Civilians. Sometimes Friendly Troops were Victims of misplaced Bomb Strikes. In the Normandy Campaign, as in other Campaigns, Air & Land Forces had to get used to working together. Bradley remarked after the War that “we went into France almost totally untrained in Air-Ground Cooperation.” It is difficult to accept this statement at face value because the Air & Ground Forces worked together with an unprecedented Harmony. Nevertheless, in the very early stages of Normandy, some “disconnects” did occur between the Air & Land Communities. Friendly Troops experienced Attacks from Allied Fighter-bombers. To minimise this danger, Air & Ground Commanders arranged for Friendly Forces to pull back in anticipation of an Airstrike against German Positions. But if Communication failed and the Strike did not come off, Troops found themselves fighting twice for the same piece of Real Estate as German Forces moved back into the Gap. Soon Commanders learned to follow-up Airstrikes with Artillery Barrages so that Friendly Infantry & Armour Forces could close with the demoralised Enemy before he recovered & redeployed. Within 6 weeks after the Normandy Landing, Air & Land Forces were so confident of working together that Fighter-Bombers routinely Operated as close as 300 yards to American Forces. Such was not true, unfortunately, of Strategic Bomber Operations in support of Ground Forces, as the Strikes of late July & August clearly indicated. 160 Aircraft – 147 Halifaxes, 8 Lancasters, 5 Mosquitos – of 4 & 8 Groups attacked an Oil and Fuel-storage Dump at Forêt De Mormal. A large column of thick smoke was rising from the Target at the end of the Raid. No Aircraft lost. 117 Aircraft – 95 Halifax’s, 16 Lancasters, 6 Mosquitoes – of 6 & 8 Groups Attacked a Oil Fuel Dump & Explosive Stores at Forêt De Montrichard, which was soon covered by a thick pall of Smoke. No Aircraft lost. 805 Aircraft – 411 Lancasters, 352 Halifax’s, 42 Mosquitoes – to Attack 7 German Troop Positions facing the 3rd Canadian Division, which was advancing on Falaise. 2 Lancasters lost. A careful plan was prepared with Oboe & Visual Marking, and with a Master Bomber & Deputy at each of the 7 Targets. Most of the Bombing was accurate & effective but, about half-way through the Raids, some Aircraft started to Bomb a Large Quarry in which parts of the 12th Canadian Field Regiment were positioned. This mistake may have been caused by the yellow identification flares which were ignited by the Canadians. It was unfortunate that the Target Indicators being used by the Pathfinders were also Yellow. Bomber Command Crews claimed that the Canadians used the Yellow Flares before any Bombs fell in the Quarry; the history of the Canadian Units says the Bombs fell 1st. The Master Bombers tried hard to stop further Crews Bombing in the wrong area but approximately 70 Aircraft Bombed the Quarry and other nearby Allied Positions over a 70-minute Period. The Canadians took Shelter in their slit Trenches and most emerged unscathed though shaken, but 13 men were killed & 53 were injured and a large number of Vehicles & Guns were hit. This was believed to have been the 1st occasion on which Bomber Command Aircraft had hit Friendly Troops during the Battle of Normandy. The Canadian Artillery Regiment was machine-gunned by RAF Spitfires & USAAF Mustangs the following day! 15th August 1944 – Volkel Airfield, Holland Lancaster lll NE123 MG-J (3.05) as Master Bomber – Very good attack. 1,004 Aircraft – 599 Lancasters, 385 Halifax’s, 19 Mosquitoes, 1 Lightning – attacked 9 Airfields in Holland & Belgium in preparation for a renewed Night Offensive against Germany. Visibility was perfect and all Raids were considered successful. 3 Lancasters lost. 348 Aircraft – 195 Lancasters, 144 Halifax’s, 9 Mosquitoes – to Kiel. 3 Halifax’s & 2 Lancasters lost. This Raid was only partially successful. Bremen: 288 Aircraft – 216 Lancasters, 65 Halifax’s, 7 Mosquitoes. 1 Lancaster lost. Visibility over the Target was clear and the Pathfinders provided perfect Marking throughout the Raid. Bremen’s own records show this to have been the most destructive Raid of the War, although only 274 Aircraft attacked, dropping just over 1,100 tonnes of Bombs. The whole of the Centre and the North-Western parts of Bremen, including the Port Area, were devastated. 402 Lancasters & 1 Mosquito of Nos 1,3, 6 & 8 Groups ordered to Stettin. 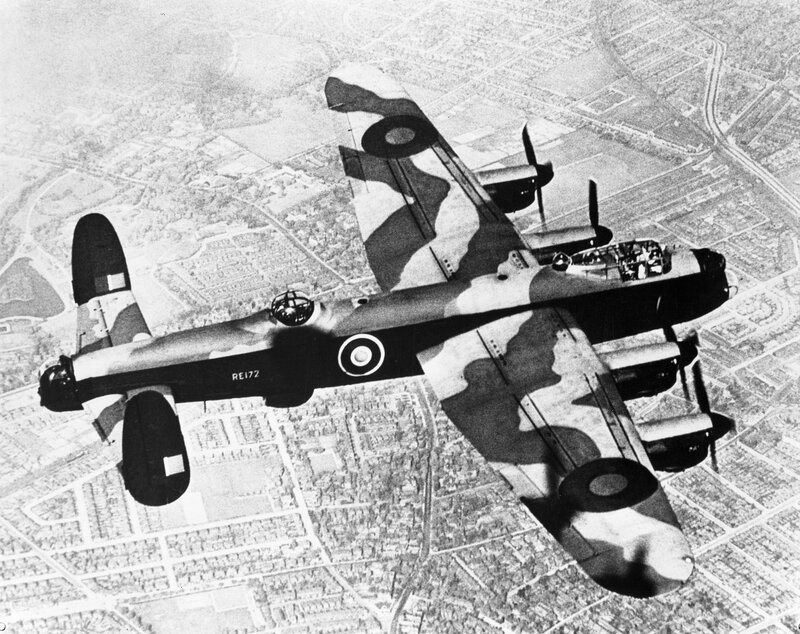 23 Lancasters lost, 5.7% of the Force. This was a successful Raid, hitting parts of Stettin which had escaped damage in previous Attacks.